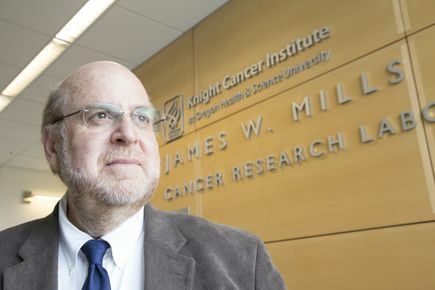 March 07, 2016 Portland, Ore.
A scientific innovator, whose achievements range from developing diagnostic biochips to creating nanoscale cancer-fighting “smart bullets” that deliver treatments to tumor cells, has been recruited to the OHSU Knight Cancer Institute to lead the first large-scale early cancer detection program of its kind. Sadik Esener, Ph.D., will direct the institute’s Center for Early Detection Research and has been awarded the Wendt Family Endowed Chair in Early Cancer Detection. He has an extensive background in bringing together scientists and technology across disciplines to provide compelling solutions to previously unsolved challenges in biomedicine. He has a strong track record in innovation; technology he developed launched many start-up companies, including five from his labs in Southern California. A professor of nanoengineering as well as electrical and computer engineering at the Jacobs School of Engineering at the University of California San Diego, Esener served as director and principal investigator of several centers of excellence in the areas of photonics and cancer nanotechnologies. Most recently, he led the Cancer Nanotechnology Center of Excellence, funded by the National Cancer Institute, at UCSD’s Moores Cancer Center to explore ways to use nanoscale devices to detect and target cancerous tumors. Esener’s recruitment comes just months after OHSU’s successful completion of the $1 billion Knight Cancer Challenge from Nike co-founder Phil Knight and his wife, Penny. The appointment signals the launch of an ambitious plan to build upon the OHSU Knight Cancer Institute’s pioneering work in precision cancer medicine with a program that will fill one of the biggest unmet needs in cancer treatment today: detecting lethal cancers when they are most treatable. A generous gift by the Richard L. Wendt Family and the Wendt Family Foundation ensures ongoing support for Esener’s role. It is the second such endowment created by the Wendt Family to advance discoveries to end cancer. The director of the OHSU Knight Cancer Institute, Brian Druker, M.D., is the JELD-WEN Chair of Leukemia Research. Esener has a breadth of experience in multiple scientific fields relevant to early cancer detection research, including micro and nanofabrication and optical, electrical and computer engineering. As a nanotechnology expert, engineer and computer scientist, he will bring an engineering systems-based approach to the role by integrating state-of-the-art technologies. Among his first responsibilities as director will be the recruitment of 20 to 30 world-class scientists and their staffs to the OHSU Knight Cancer Institute’s Center for Early Detection. Esener will hire scientists from varied backgrounds, including the fields of cancer biology, oncology and medical engineering, to collaborate on improving early detection. Leveraging science already underway at the OHSU Knight Cancer Institute, one of the first projects the program will undertake will be to develop liquid biopsy biochips that can serve as ‘early warning’ tools to gauge disease risk. Early detection of lethal forms of the disease is crucial to realize the full promise of precision cancer medicine. By more fully understanding the molecular drivers of the many forms of the disease, cancer can be more precisely detected, diagnosed and treated. Esener is expected to join OHSU in summer 2016. Particulars: Druker is a Howard Hughes Medical Institute investigator and associate dean for oncology in the OHSU School of Medicine. The Wendt Family’s long-time support for the OHSU Knight Cancer Institute began in 2001 with their funding of the JELD-WEN Chair of Leukemia Research held by Brian Druker. The Knight Cancer Institute at Oregon Health & Science University is a pioneer in the field of precision cancer medicine. The institute's director, Brian Druker, M.D., helped prove it was possible to shut down cells that enable cancer to grow without harming healthy cells. This breakthrough has led to new treatments that make once-fatal forms of the disease manageable. Building on this scientific leadership, the institute is launching a large-scale research program dedicated to advancing precision early detection of lethal cancers, one of the most significant unmet needs in cancer care. The OHSU Knight Cancer Institute is the only National Cancer Institute-designated Cancer Center between Sacramento and Seattle – an honor earned only by the nation's top cancer centers. It is also headquarters for SWOG, one of the NCI’s largest research cooperatives. In addition to its robust research programs, the institute offers the latest treatments and technologies as well as hundreds of clinical trials.